Composed by member from all around the world, we aim to accomplish all the daily Guild Activities on Tier 7, raising Guild Currency to all of our members. We are a primarily focused on having fun with guild members and enjoying the game. As we all know its not easy to accomplish every objective and reach the top, without some organization and setting some goals. That is why we are a Mixed P2P and F2P guild. With some dedication, strategy and smart usage and maybe a little investment with crystal, its possible to maintain a good place in Arena Rank and have a better crystal payout. Contributing to your success in the game. You don't need to be a whale, a little bit here and there its more than enough to play this game competitively. But that its not the requirement needed to become a member in Global Force. 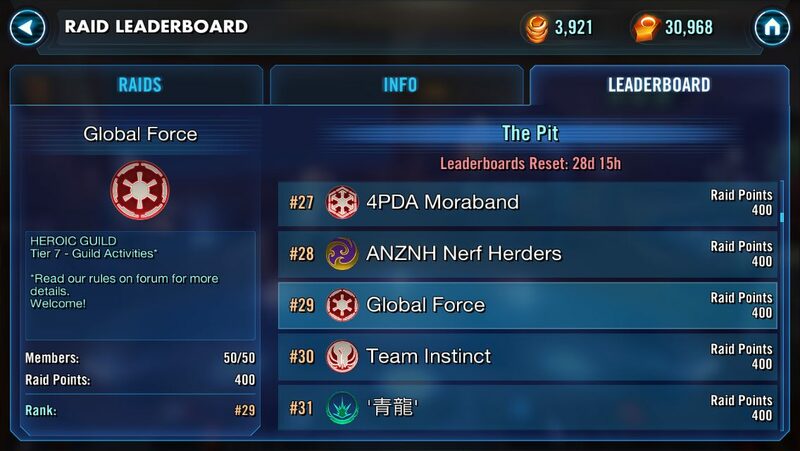 Like we've already said it, a smart usage on crystals and better place on arena ranking, its enough to be part of our guild. So be prepared to contribute as a active member and reach all of your goals together. And apply now. So if you need to address anything related to the guild you can address to them. And your request, complaint and suggestion will be heard and debated. All members must respect each other. No member should disrespect any member for your gender, race, creed, sexual orientation, side of the force. If it happens some conflict with another member, don't try to resolve in public. Reach out him first, then try to contact one of the members of the council. The member must be active and participate on the guild community on Telegram Group. All the important announcements will be given there. Its extremly important, because once they are made its your responsability as a member to read and have knowledge of information. We wanna try to avoid "I didn't see" or "I didn't knew" situations. So its your responsability. All member who stay offline more than 48h (without a warning) will be automatically kicked from the guild. - EVERYDAY: 600 Guild Bank Coins, on Personal Guild Contribution. The rules can be changed at any moment in need. It always be informed and widely release when it does. Fill all the requirements field (Ally Code/Player ID) and sync your account. "The force shall set you free"
I've sent you an ally invitation. I'm sorry but you are in short 7* characters. We are doing Tier VI RAID, you are probably not ready yet. @Dred I'll check if we have another open spot. Looking for 2 more active players! We'll be completing our third tier 6 raid soon so now is the chance to join! @Eladrion I've sent you a PM. This is a fantastic guild with an active chat and great members from around the world. Join us for a chance to win great rewards! Almost halfway through our 3rd tier 6 raid! I'm not part of the guild anymore, because of personal reason, but still active in the private chat. It's a very friendly guild for mixed p2p and f2p player with a good strategy for guild raids and a familiar atmosphare. SyN KarlMalown ....yall have girls? If so....we would like to engage in a trade before the mid guild trading deadline...just message me we got 2 guys on the trading block. Looking for one more person to fill the last spot!